Nearly two months after India inked the FTA with the ASEAN, a joint panel comprising government officials and trade experts of India and Indonesia have recommended a similar trade deal between the two sides. Trade economists maintain that the negotiations on the bilateral CECA will be tough as it would have to be more liberal than the ASEAN FTA, which was concluded after more than seven years of intense bargaining. “The question is, are both the sides ready for committing more than whatever has been agreed to in the ASEAN FTA,” said Biswajit Dhar, DG, Research and Information System on Developing Countries (RIS). Why is it imperative to form an Asian Economic Community? 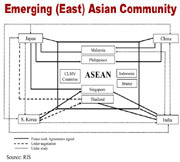 What will be benefits of Asian Economic Community Asia? How Asian Economic Community can be built? What should be the scope of Asian Economic Community?